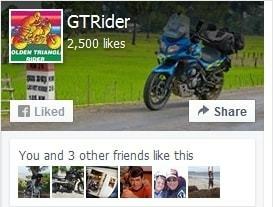 The GT Rider guide map to Thailand’s rugged North-west frontier on the Burma border. This map covers Asia’s legendary Motorcycle Loop – The Mae Hong Son Loop and the road of 1,864 bends. The map is highly detailed showing scenic highlights, highways, distances, accommodation and activities en route. Chiang Mai – Pai – Soppong – Mae Hong Son – Khun Yuam – Mae Chaem / Mae Sarieng – Doi Inthanon – Chiang Mai. First timers can easily spend 4-6 days on the loop, and dirt bike fans can spend even longer exploring the intricate network of trails criss-crossing the jungle clad mountains. Surveyed with a GPS it is incredibly reliable, with accurate road descriptions & scores of dirt trails for the dirt adventure rider; to make most riders want to stay longer for more exhilarating action. 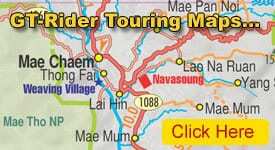 For dirt riders the Mae Hong Son Loop has the best dirt tracks and dirt bike riding in North Thailand; and this map is guaranteed to please off-road fans with its hundreds of kilometres of dirt trails. Buy one today and start planning your trip. There’s at least a week of good trail riding waiting out there for you. With the topography, eight city and three environs maps, plus fourteen elevation profiles it is undoubtedly the most accurate map guide to The MHS Loop. Unbelievable detail & information. The absolute best! Laminated- waterproof – indestructible. You can’t lose, hundreds of kilometres of twisting mountain roads – asphalt & dirt! NOTE: the Map Sales Cart & Checkout options are located at the bottom of the right sidebar / column.